Max Colbe Story - The sacrifice of one as an illustration of what Jesus Christ did for us. Here is a great modern day true-life story of one person giving his life for another. Maximillian Koble was a priest who died in Auschwitz. His life story has been used as a modern day example of a good man dying for another. After the outbreak of World War II, which started with the invasion of his nation by Nazi Germany, Kolbe provided shelter to refugees from Greater Poland, including 2,000 Jews whom he hid from Nazi persecution in his friary in Niepokalanów. On 17 February 1941, he was arrested by the German Gestapo and imprisoned in the Pawiak prison. On 28 May, he was transferred to Auschwitz as prisoner #16670. 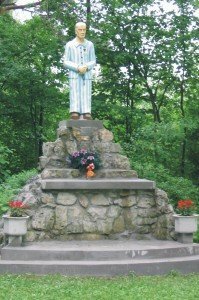 At the end of July 1941, three prisoners disappeared from the camp, prompting SS-Hauptsturmführer Karl Fritzsch, the deputy camp commander, to pick 10 men to be starved to death in an underground bunker in order to deter further escape attempts. When one of the selected men, Franciszek Gajowniczek, cried out, “My wife! My children!”, Kolbe volunteered to take his place. In his prison cell, Kolbe celebrated Mass each day and sang hymns with the prisoners. He led the other condemned men in song and prayer and encouraged them by telling them they would soon be with Mary in Heaven. Each time the guards checked on him, he was standing or kneeling in the middle of the cell and looking calmly at those who entered. After two weeks of dehydration and starvation, only Kolbe remained alive. The guards wanted the bunker emptied and they gave Kolbe a lethal injection of carbolic acid. Some who were present at the injection say that he raised his left arm and calmly waited for the injection. His remains were cremated on 15 August, the feast day of the Assumption of Mary.